Olds still carries a guitar around quite a lot of the time. The other day, Vance County's chief of animal services — and Olds' boss — Frankie Nobles suggested he pull it out and put on a little show for the shelter's animals. "I said, 'Go sing to the dogs,'" Nobles told TODAY. There's research showing that music helps soothe shelter pets in what can be a very loud and stressful environment. But Nobles and Olds didn't know how their dogs would respond to the crooning until he began to play — and the animals instantly reacted. "They just stopped barking," said Olds. "It blew my mind." Another is to encourage other shelters to try performing for their pets since they seem to enjoy it so much, and happier shelter pets get adopted more readily. Nobles said he's already hearing from folks at other shelters that they're going to give it a try. The third point is to help draw attention to the shelter and its many cats and dogs. "What we did it for is the exposure for the animals," said Nobles. "We want to find them homes," Olds added. "Get them adopted." 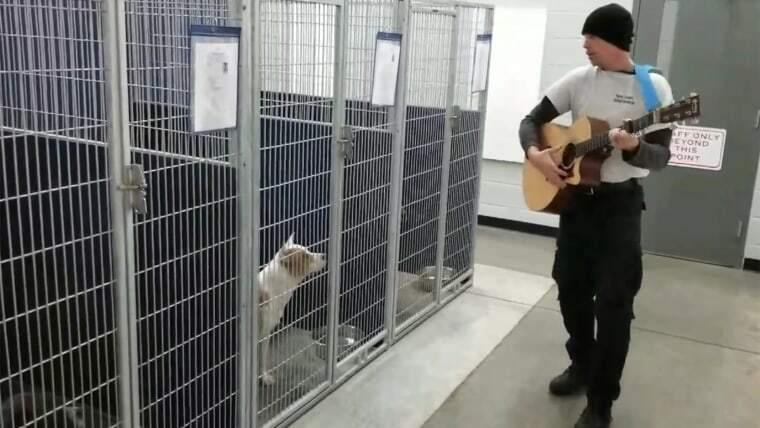 The first concerts went so well that Olds and Nobles are planning to make it a regular thing as part of the shelter's "enrichment" program, which includes toys, treats and activities that help keep the animals' minds and bodies engaged while they're awaiting adoption. Nobles said the whole animal care staff wants to get involved in the next performance. And yes, they're going to film that one, too. Stay tuned on the shelter's Facebook page. "People may quit watching," Nobles said. "We're going to try it."